Acadia Systems, Inc. installs and configures Ubiquity UniFi enterprise level Wi-Fi hardware and software to better server your end users! UniFi® is the revolutionary Wi-Fi system that combines Enterprise performance, unlimited scalability, a central management controller at a reasonable cost. The UniFi®Controller can be accessed through any device using a web browser. A single UniFi Controller running in the cloud can manage multiple sites: multiple, distributed deployments and multi-tenancy for managed service providers. The UniFi® Controller enables the administrator to instantly provision and configure thousands of UniFi APs, allowing for quick, simple management of system traffic. Easy customization and advanced options for Guest Portals include authentication and Hotspot setup options. 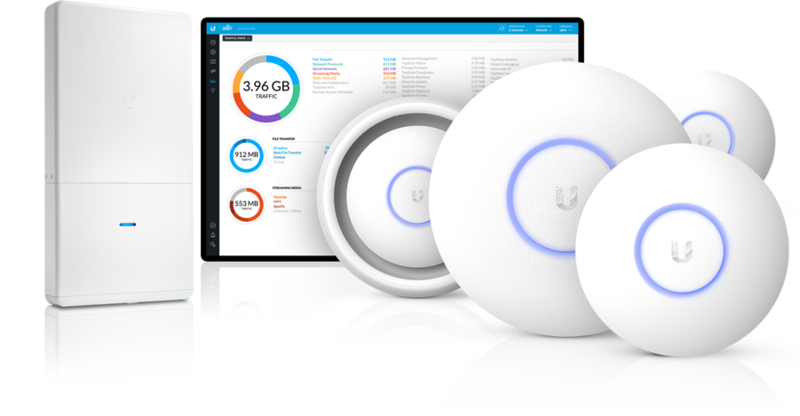 Take advantage of UniFi’s rate limiting for your Guest Portal and Hotspot package offerings. Apply different bandwidth rates (download/upload), limit total data usage and limit duration of use. Real-time statistics track performance, number of clients, traffic and current usage. Use the configurable reporting and analytics to manage large user populations and expedite resolution of issues. UniFi® makes it easy to view and set up email delivery of alerts and recent event notifications on your network(s). Get alerts for important events and keep track of specific users and guests.